When law and order were established we returned to live in Joo Chiat. I attended Choon Guan School at Koon Seng Road to learn Japanese language and writing. I studied Hiragana which was the easier version of Japanese script. The other script, Kata Kana with Kanji was for higher classes. I also learned to sing some Japanese songs. The first song was Kimi Gayo, Japanese National Anthem. Then came 'arukay arukay'. I am not sure of its meaning. It could mean 'walking' as the song was sang when the class walked round and round the playground. There were many other songs such as 'Heitai San Konichiwa' (greeting Japanese soldiers), Kutsu gu Naru and Momo Taro San. My favourite song was 'Momo Taro San'. It was from a Japanese Folklore. There were four characters in the story. Momo Taro San, the little boy and his three friends, a bird, a monkey and a dog. They fought the demons and won. The moral of the story was good over evil. For non school song, I can only remember 'Sinanoyorau', a Japanese love song. 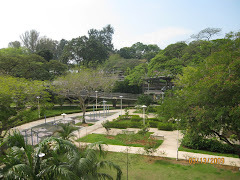 When the British returned to Singaopore, I was registered in the Telok Kurau English School for my primary education. 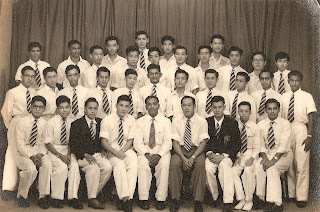 In 1951, I was promoted to secondary school at Raffles Institution It was situated at the junction of Bras Basah Road and North Bridge Road. The school had a very good reputation and I felt elated putting on the school's badge and the white uniform. Wearing long trousers to school also helped my ego that I was an adolescent. I went to school by Singapore Traction Company bus No. 22. It was always crowded and very often I had to stand all the way to school. There were uniformed groups in the school such as cadets, scouts and St John ambulance. I signed up for the cadet corps. During the drill at the school field, I found the world war two .303 rifle was too heavy for me. I must admit that I was a weakling then. I paid $10 to the school to get out of it. It was a lot of money at that time. 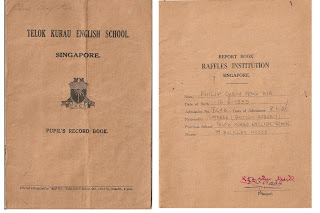 There were two scout groups in the school, the 2nd Raffles Group and the 32nd Raffles Group. I signed up with the latter until I left the school in 1954.